Mixed response to Trump's condemnation of violence at white supremacist rally in Virginia from ADL, WJC and Reform Union president. Liberal Jewish groups and Jewish leaders condemned the violence at a white supremacist event in Charlottesville, Virginia Saturday. “The vile presence and rhetoric of the neo-Nazis who marched this weekend in Charlottesville is a reminder of the ever-present need for people of good will to stand strong, to speak loudly against hate, and act both to delegitimize those who spread such messages and to mitigate the harm done to the commonweal of our nation and to those that are the targets of hate messages,” Rabbi Rick Jacobs, president of the Union for Reform Judaism, said in statement issued on Saturday evening, adding that “once again, hate has killed." Three people were killed as a result of the weekend neo-Nazi event. 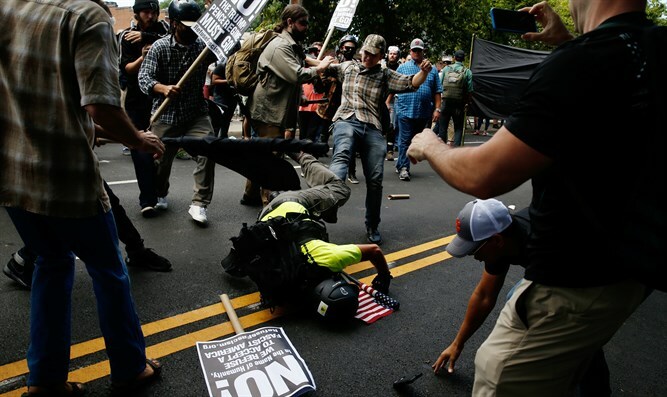 One woman was killed and 19 injured, some seriously, after a car driven by an Ohio man slammed into a crowd of counterprotesters. The driver, identified as James Alex Fields Jr., 20, of Maumee, Ohio, was taken into police custody and the incident is under investigation. Two Virginia state troopers were killed when their police helicopter crashed and caught on fire while responding to clashes between white supremacist protestors and counterprotesters. “We commend the opening of President Trump’s statement condemning the “egregious display of hatred, bigotry and violence” but are deeply troubled by the moral equivalence evident in President Trump’s statement today. White supremacists wielding Nazi flags and spewing racist vitriol need to be specifically condemned, not only violence and hate ‘on many sides.’ If our leaders can’t call out this virulent strand of hate we will surely fail to stop it,” Jacobs also said in his statement. “What is vital now is a swift restoration of law and order and the protection of innocent lives. No citizen should ever fear for their safety and security in our society,” he also tweeted. The FBI announced that it was launching a "civil rights investigation" into the incident. Ronald Lauder, president of the World Jewish Congress, condemned the “inconceivable violence” on display in Charlottesville. ““It is utterly distressing and repugnant that such hatred and bigotry still run rampant in parts of this country. There is no place in our democratic society for such violence and intolerance. We must be vigilant and united in our opposition to such abhorrence,” he said in a statement. Anti-Defamation League CEO Jonathan Greenblatt condemned the violence in Charlottesville in a tweet posted Saturday afternoon. “Mayhem in #charlottesville. We pray for victims of #violence & condemn those who marched thru streets chanting #hate,” he tweeted. He also praised Trump for condemning the violence but criticized him for not specifically condemning the white supremacist movement. “Glad @POTUS blasted violence but long overdue for moral ldrshp that condemns the agents of #hate: #WhiteSupremacists, #NeoNazis, #AltRight,” he tweeted.